Here at I.C. Enterprises, we have a desire to help you, the small business owners, achieve success with creating an online presence that is both effective and professional. Constantly evolving and keeping up to date with the latest trends in web design and online business marketing, we provide solutions that help you keep ahead of the competition online; from high quality custom designed websites, to tips, tricks, processes and resources to help you get noticed online. We are also creating a range of articles in the Blog area to provide information on a variety of online subjects to help keep you up to date and on track. Our goal is to provide high quality products and services that can take your business to the next level by creating a professional online presence for your brand and using proven online marketing methods that work. We are currently working on an online training model to provide relevant information and instructions to get the best out of your businesses online presence. This will be created with modules that will give you the knowledge to leap ahead of your competition online and have a truly successful internet presence. In the late 1990’s, I got my very first desktop PC. It was the start of a passion for web design and online marketing. Back then, when the web was still newish to the mainstream, and web design was basic and somewhat limited. A good site usually was something that had bright, over the top colours and animated gifs everywhere. I taught myself HTML online from as many different sources as possible, using notepad on my PC to hand code all my experimental designs. I must admit I made some pretty bizarre creations back then, but luckily did not put them online! As the web standards evolved, so did my own level of education and skill. The advent of WordPress, albeit mainly as a blog system back then, showed me the possibilities that were coming. As soon as the WordPress codex was ready for it, I started using it to create content management systems. There were other “more suitable” systems out there, such as Joomla and Drupal, but there simply wasn’t anything quite as user friendly for my needs as WordPress. Now I use WordPress for a majority of my client projects, and for my own websites. I still code a few sites in HTML and CSS, but now use Dreamweaver to do that rather than Notepad. Design and creation has always been my passion, and I am thankful that my chosen line of work gives me the opportunity to share this passion with others through my work. I spent 20 years working in the Direct Mail and Marketing industry before following my true passion with Web Design, Video Production and Online Marketing. Along the way I studied and achieved an Advanced Diploma in Multimedia and also achieved a Certificate IV in Training and Assessing which led to a two and a half year stint teaching Diploma level subjects through SuniTAFE (Sunraysia Institute of Tertiary and Further Education) in Mildura, Victoria. 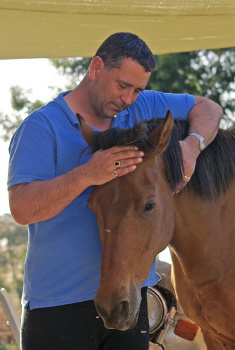 I now live in the Adelaide Hills, South Australia, with my wife Paula, our dog Roxy and horses Marty and Boz.